No one loves over-reaching ineffective regulation more than the EPA, and on April 22, 2008, the EPA created a rule which officially went into effect April 22, 2010, dealing with lead paint removal in pre-1978 buildings. It is known as the Lead Renovation, Repair, and Painting Program (RRP Rule). This rule will affect you if you are a renovation contractor or homeowner in a pre-1978 building with a child living there under 6 years of age. The EPA created the rule under the authority of section 402(c)(3) of the Toxic Substances Control Act (TSCA). We all know ingested lead paint or lead paint dust is a health hazard to young children, which is why it has not been used in homes for over 30 years. Even though minimum threshold elevated blood lead levels (EBLLs) as a percent of children under 6 years of age as reported by the Center for Disease Control (CDC) decreased by almost 90% without additional EPA interference, the EPA was still compelled to write this new rule. The CDC has not publicly posted EBLL results past 2007, but if you perform an exponential regression analysis on the CDC data from the 10 years 1997 to 2007, the elevated blood lead levels of children under 6 years of age projects out to be about 0.5% of children aged 5 and below in 2010, or roughly 130,000 children out of a total child population under 6 years of about 25,000,000. So let’s be clear. Now that the heavy lifting of 30 years reducing minimum threshold elevated blood lead levels in children under 6 had resulted in a risk level of about 0.5% in 2010 (when it was as high as almost 8% in 1997), the EPA rolls out a major lead paint rule so that it has the most cost to consumers and contractors alike, with the least amount of benefit. That is the EPA. Some 30+ years after the phase-out of lead-based paint we are now at a point where health risks to young children from this old paint technology are at about 0.5%, the EPA lumbers into action. This RRP rule from the EPA is intended to address lead-based paint hazards created by activities from renovation, repair, and painting that disturb lead-based paint in target housing and child-occupied facilities. What is and is not a "Child-Occupied" facility? Under this rule, a child-occupied facility is a building, or a portion of a building constructed prior to 1978, visited regularly by the same child who is under 6 years of age on at least two different days within any week (Sunday through Saturday period), provided that each day's visit lasts at least 3 hours, and the combined weekly visits last at least 6 hours, and the combined annual visits last at least 60 hours. The rule is changing the risks these contractors assume and increasing the costs of simple home repair projects. An actual cost analysis by Remodeling Magazine shows compliance with the EPA rule will increase costs to contractors, and ultimately to you, at levels many times higher than the EPA hype. As opposed to a low additional cost to comply of between $8 to $167 per project as promoted by the EPA, real-world costs to comply with this Rule can easily increase home renovation projects between $1,300-$2,200 more for a bathroom remodel ordinarily valued at $10,000. Exterior projects can be more due to additional costs for vertical containment plastic sheeting and structure. This also creates confusion to the consumer since contractors that do not want to comply can under-bid those contractors that do comply since they do not have the additional costs. Using a heat gun at temperatures greater than 1100 F.
Contractors may use various methods to minimize dust generation, including using water to mist areas before sanding or scraping, scoring paint before separating components, and prying and pulling apart components instead of breaking them. Clean up procedures: The work area should be cleaned up daily to keep it as clean as possible. When all the work is done, the area must be cleaned up using special cleaning methods before taking down any plastic that isolates the work area from the rest of the home. The special cleaning methods include using a HEPA vacuum to clean up dust and debris on all surfaces, followed by wet wiping and wet mopping with plenty of rinse water. When the final cleaning is done, look around. There should be no dust, paint chips, or debris in the work area. If you see any dust, paint chips, or debris, the area must be re-cleaned. Is drilling into your wall a lead hazard? The removal of large structures, including demolition of interior plaster walls. Repairs resulting in isolated small surface disruptions such as drilling and sawing into wood and plaster. 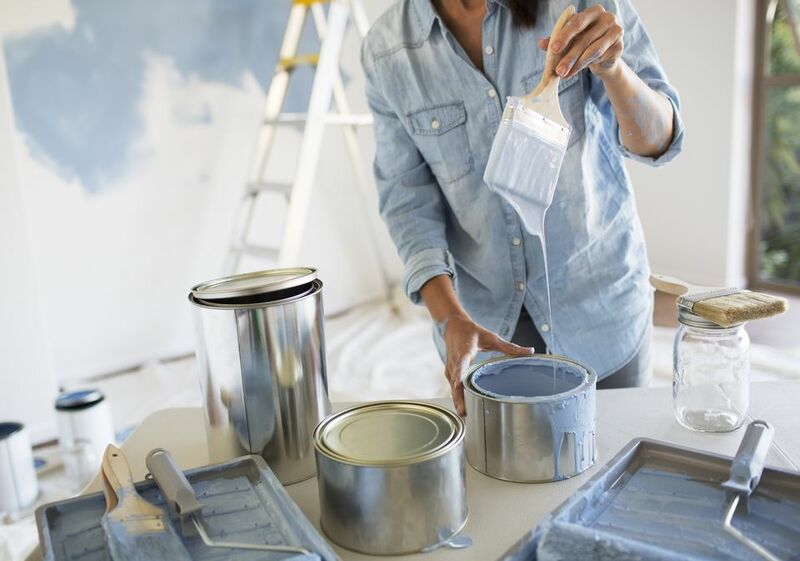 With this new EPA rule, drilling into your plaster wall which has lead paint on it somewhere in its history now creates a dangerous lead dust hazard. Renovation companies must be certified by the EPA and pay a $300 fee for a 5-year certification. Renovation contractors themselves must take an 8-hour Lead Safety course, EPA/HUD Model Renovator Training Course, and be certified in lead safety. It’s the same training a contractor has to take for another lead safety program under HUD authority. If you are a non-certified laborer, you have to be directly supervised by a certified renovation contractor (certified renovator) and obtain lead safety work practice training while on the work site. The renovation contractors must use lead-safe work practices which address setting up work, protection, prohibited work practices, and remediation clean up. Renovation contractors must then “educate” the occupants of the home about the hazards and risks of lead paint exposure during construction and give them an EPA brochure called The Lead-Safe Certified Guide to Renovate Right. Renovation contractors then have to document how they complied with the EPA’s regulations for the RRP rule and keep those records for 3 years just in case the EPA wants to audit the contractor. In addition to the EPA’s RRP Rule, if contractors are working in target housing units receiving HUD funds, then they are also subject to the U.S. Department of Housing and Urban Development’s (HUD) Lead Safe Housing Rule (known as LSHR) described in HUD regulations at 24 CFR Part 35. HUD provides this table describing the differences between HUD LSHR and EPA RRP regulations. So, what is the price for non-compliance? The EPA can levy a fine of $37,500 per violation for non-compliance with their rules. The first contractor to be made an example of has already been selected by the EPA: Rockland, Maine contractor Colin Wentworth faces a minimum of $150,000 in fines from the EPA for alleged violations captured by an "anonymous" YouTube video which may have been provided by a competitor.